Student Loan Debt Counseling | HELP CDC :: Welcome! Borrowing money to pay for your college education is often the easy part. However, choosing the best repayment options when you leave school can range from confusing to downright overwhelming. Seven in 10 seniors (68%) who graduated from public and nonprofit colleges leaves with a student loan debt load average of $30,100 per borrower. 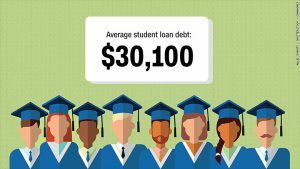 HELP CDC has partnered with Consumer Debt Counselors to provide student loan counseling services to borrowers who are overwhelmed by the many repayment options for Federal student loans. Our counselors are trained to consider all debts and have knowledge of the various student loan programs and--more importantly--the repayment options available under each program. Input your basic information and Federal loan information. You can download all of your loan information via your National Student Loan Data System (NSLDS) website. After you answer approximately 25 questions tailored to your unique situation, you will have access to all of your qualified options including--potential discharges, repayment plans, rehabilitation and more. For a low fee of $69.95 you will be able to download your customized analysis--in minutes! It's just that easy! You can choose to complete the process on your own...just follow the specific instructions on your report. The Student Loan Advisor will analyze your customized report. During your one-hour one-on-one session, the Advisor will help you evaluate your options as it relates to your financial goals and your budget. The two of you will identify the right solution FOR YOU! DETAILED STEPS TO IMPLEMENT YOUR SOLUTION(S). * If you have private loans, you will need to speak with your loan servicer to discuss what options are available to you. ** Student Loan Counseling is a non-profit, fee-for-service program. IT'S TIME TO GET AN EDUCATION ABOUT YOUR STUDENT LOAN OPTIONS... DO IT TODAY!